Most politicians would love nothing more than to take gun owners’ votes and then never hear from us again until the next election rolls around. Well, I believe it’s time for you and me to send a loud and clear message to the General Assembly that the days of taking our votes and then doing nothing in return are OVER. 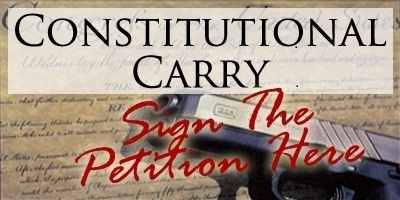 So won’t you please sign petition to your State Representative and State Senator urging them to vote to pass the Iowa Constitutional Carry Bill? More on that below. As you know, if passed, Constitutional Carry would restore the right of every law-abiding Iowa citizen to carry a gun to protect themselves and their families — WITHOUT going through a bunch of bureaucratic rigmarole! This is the way it’s done in Alaska, Arizona, Wyoming and Vermont, Arkansas — and most of Montana. And despite the hand-wringing of the gun-grabbers, the news media and government bureaucrats, those states have not seen a rise in shootouts and vigilante justice since passing Constitutional Carry. When law-abiding citizens are able to protect themselves, criminals soon realize they had better start looking for another line of work. The fact is, the gun-grabbers’ overbearing and UNCONSTITUTIONAL “regulations” and “requirements” are meant to do nothing more than undermine the Second Amendment rights of law-abiding citizens just like you and me. After all, do CRIMINALS ask for government permission before they carry a concealed weapon? Do CRIMINALS have to pay fees or take training classes? All they have to do is claim they’re worried you may commit a crime in the future – a power which will almost certainly be abused in certain areas. Simply acknowledging mental stress to an anti-gun government psychologist upon returning from war could trigger the ban. Some estimates show these regulations cost law-abiding Iowa gun owners up to $3 million every year, which is why some “pro-gun” organizations (of whom many are firearms instructors) supported this provision in the past. The good news is, Iowa Second Amendment supporters just like you have already proven we can create a grassroots firestorm. After all, in the last session of the General Assembly, it was Iowa Gun Owners’ members and supporters who succeeded in stopping every piece of anti-gun legislation that was thrown at us in the wake of the Newtown, CT tragedy. We will have our hands full again this year as we fight to stop Universal Registration here in Iowa too. You’ll be hearing about that. But at the same time, we need to force the General Assembly to KEEP ITS PROMISES and pass Constitutional Carry when they come back to Des Moines next week. You see, as we approach the all-important 2014 mid-term elections, the politicians in Des Moines know that they need to make good on the campaign promises that they’ve made. But this fight won’t be easy. Radical anti-gun BILLIONAIRE and former NYC Mayor Michael Bloomberg may likely pour millions into Iowa to browbeat weak-kneed politicians into DEFEATING Constitutional Carry – in fact he’s already opened a political organization right here in Iowa! Over the next few months, my goal is to gather up to 100,000 petitions from Second Amendment supporters just like you so that we can FLOOD the General Assembly with these petitions and show every elected official in Des Moines you and I mean business. Then, using mail, email and phone banks, I plan to recruit an additional 50,000 Second Amendment supporters all across Iowa to help join in this fight. And when the fight really begins to heat up, my hope is to run targeted newspaper and radio ads to help us get the votes to put us over the top. Unfortunately, I’m afraid even all this won’t be enough. If you and I want to DEFEAT the gun-grabbers’ anti-gun lobbying machine, I’m afraid you and I must be prepared to run hard-hitting television ads in key districts, as well. They won’t be cheap. So I must ask for your generous financial support, as well. Some generous Second Amendment supporters have already chipped in $500 or more. Believe me, I know that’s a lot to ask for! But if you could afford a contribution of $250, $100, $50 or even $35, I would be extremely grateful and will put it to IMMEDIATE use. First, please sign your petitions below so I can deliver them with thousands of others to the General Assembly. Then I hope you’ll consider your most generous contribution of $500, $250, $100, $50 or $35 TODAY! There’s not a moment to waste. Please act TODAY! P.S. It’s up to you and me to force our politicians to KEEP THEIR PROMISES when they return to Des Moines. But knowing gun rights are on the move, national anti-gun groups, the anti-gun media, and anti-gun politicians are going to go all-out to DEFEAT Constitutional Carry here in Iowa. That’s why it’s vital you sign your petition to your State Representative and Senator IMMEDIATELY. And I hope you’ll consider your most generous contribution of $500, $250, $100, $50 or $35 IMMEDIATELY. IOWA GUN OWNER ALERT – Call Now! !